One way to fully appreciate the role of the cerebellum in normal function is to examine those signs associated with its dysfunction. These include muscle weakness (asthenia), a decrease in muscle tone (hypotonia), to-and-fro movements of the eyes (nystagmus), muscle tremor while performing a voluntary task (intention tremor), and a general loss of muscle coordination (ataxia). Ataxia is apparent through problems with posture and gait and is further evidenced by dysmetria, asynergia, and adiadochokinesia. The cerebellum appears to function as a comparator, at least with respect to its role in muscle control. A sample of the motor command from the cerebral cortex to the skeletal muscles is relayed to the cerebellar cortex for evaluation (Fig-1). 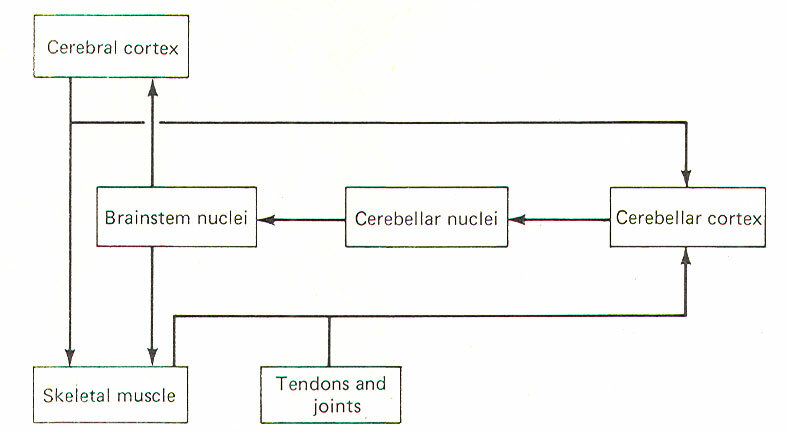 Once the motor act begins, the cerebellar cortex begins to receive input (via spinocerebellar tracts) from the proprioceptors in those muscles, tendons, and joints involved in the movement. In this way the cerebellum is in a position to compare the actual performance of a given movement with the original "intent" of the brain. Of course this comparing only has functional value if the cerebellum is capable of making adjustments when the actual performance doesn't equal the intent. As illustrated in Fig-1, the cerebellar cortex, through the cerebellar and brainstem nuclei, can direct corrective action both at the cortical source through ascending pathways, as well as at the spinal cord level through descending pathways. It is important to recognize that this simplistic mechanism is by no means intended to fully explain the role of the cerebellum in motor control, but is probably a good starting point from which to understand the cerebellar function. The cerebellum is the largest part of the metencephalon. It lies posterior to the pons, from which it is separated by the fourth ventricle. It is separated from the cerebrum above by a dural covering, the tentorium cerebelli. It weighs about 150 g in the adult male and the ratio of cerebellar to cerebral mass is greater in the adult than in the child. Like the cerebrum, the cerebellum is composed of cortical gray matter surrounding a large area of subcortical white matter. Similarly, the cerebellar surface is regular and grooved, forming folia (folds). Some of the grooves are particularly deep, forming fissures, which separate the cerebral mass into lobules. Also, the cerebellum is composed of two hemispheres separated (in this case) by the vermis (Fig-2). The cerebellum is held firmly to the brainstem by the cerebellar peduncles. 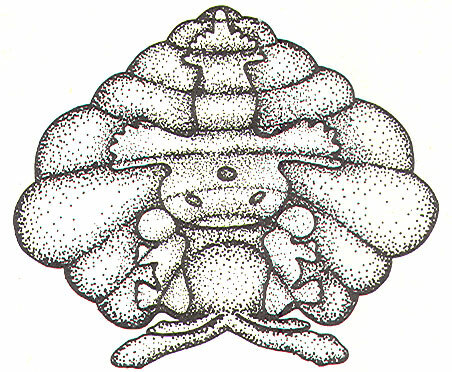 In Fig-2, the peduncles are illustrated with the cerebellum removed. Figure-3 shows a midsagittal section of the cerebellum through the vermis. The vermis is divided by short, deep fissures into the lingula, central lobule, culmen, declive, folium, tuber, pyramid, uvula and nodule. 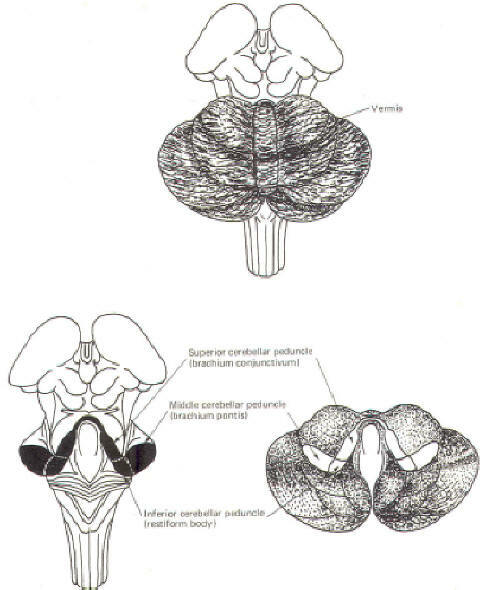 Figure-4 shows a somewhat artificial "opened" view of the cerebellum as seen from the rear. It can be seen here that each vermial division, with the single exception of the lingula, is continuous laterally with a lobule of the cerebellar hemisphere. These include the central lobule with the ala of the central lobule , the culmen with the quadrangular lobule, the declive with the lobulus simplex, the folium with the superior semilunar lobule, the tuber with the inferior semilunar lobule and gracilis, the pyramid with the biventral lobule, the uvula with the tonsil, and the nodule with the flocculus. Phylogenetically, the lingula along with the flocculonodular lobe (nodule and flocculi) are called the archicerebellum and represent the cerebellum's most primitive component. 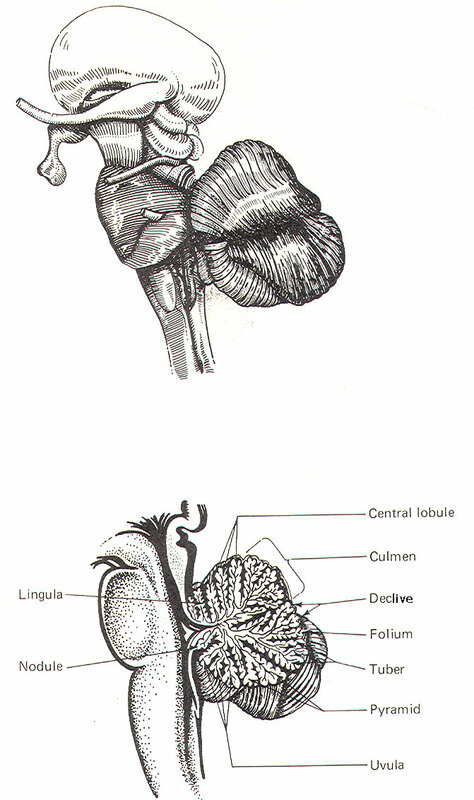 Because of its close functional relationship with the vestibular system, it is also sometimes called the vestibulocerebellum (stippled area of Fig-4). The central lobule with its alae, the culmen with its quadrangles, as well as the pyramid and uvula, comprise a somewhat more recent phylogenetic development of the cerebellum called the paleocerebellum or spinocerebellum, because of the large input it receives from the spinal cord. 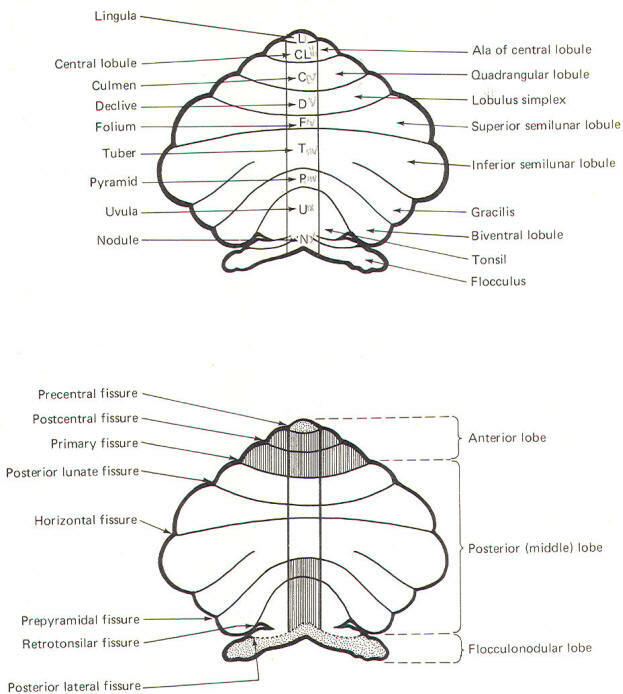 The most recent addition to the cerebellum is the neocerebellum, composed of the declive, folium, and tuber along with their lateral hemispheric extensions. Also included are the biventral lobules and tonsils. The neocerebellum is also called the pontocerebellum because most of its afferent input is via the pontocerebellar tracts. 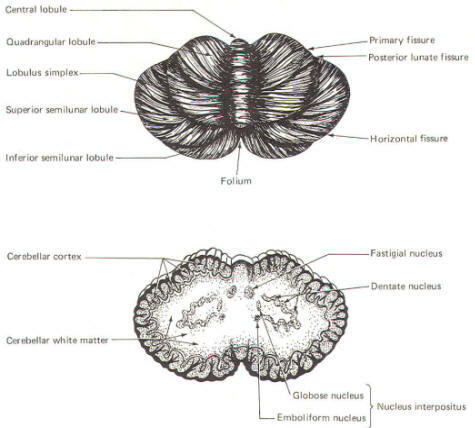 Another similarity between the cerebellum and the cerebrum is the presence of nuclei in the subcortical white matter. These are respectively called intracerebellar nuclei in the cerebellum and basal nuclei in the cerebrum. The intracerebellar nuclei are paired and located on either side of the midline. The largest and most lateral is the dentate nucleus (Fig-5). Medial to this in order approaching the midline are the emboliform, globose, and fastigial nuclei. The emboliform and globose nuclei are known collectively as the nucleus interpositus. The intercerebellar nuclei function as important relay centers between the cerebellar cortex and other parts of the brain, brainstem, and spinal cord. Considering the importance of the cerebellum in motor control, it is not surprising to find that there are numerous neural pathways connecting it with the cerebral cortex, brainstem nuclei, spinal cord proprioceptive tracts, and the vestibular system. The information-conducting fibers entering and leaving the cerebellum pass through the superior, middle and inferior cerebellar peduncles. The inferior cerebellar peduncles (restiform bodies) are thick bundles of afferent and efferent fibers which diverge as they ascend from the posterior aspect of the medulla oblongata. As they arch backward to enter the cerebellar hemispheres, they converge medially and are bounded laterally by the middle cerebellar peduncles (Fig-2). Most of the inferior cerebellar peduncular fibers are afferent, although there are some efferent routes as well. The names of these tracts or fiber bundles, as well as the location of the cell bodies of their fibers and their distribution, are summarized in Table-1. The afferent tracts include the olivocerebellar, paraolivocerebellar, vestibulocerebellar, reticulocerebellar, posterior spinocerebellar, cuneocerebellar, and trigeminocerebellar. Also included are the anterior external arcuate fibers and the striae medullares. The efferent fibers include the cerebelloolivary, cerebellovestibular, and cerebelloreticular tracts. The middle cerebellar peduncles (brachie pontes), the largest of the peduncles, are composed chiefly of fibers of the pontocerebellar tracts. These fibers originate in the contralateral pontine nuclei, sweep across the anterior aspect of the pons, and then project posteriorly through the peduncles to terminate in the cortex of the cerebellar hemispheres and vermis, except the lingula and flocculonodular lobe. The superior cerebellar peduncles (brachia conjunctiva) emerge from the cerebellum and ascend to form the lateral portion of the roof of the fourth ventricle, where they enter the brainstem below the inferior colliculi. They are bridged by the superior medullary velum. The superior cerebellar peduncles represent the main output route from the cerebellum, and as such, most of their fibers are efferent. However, some afferent input utilizes this route as well. Again, the names of these tracts or fiber bundles and their distributions are summarized in Table-1. 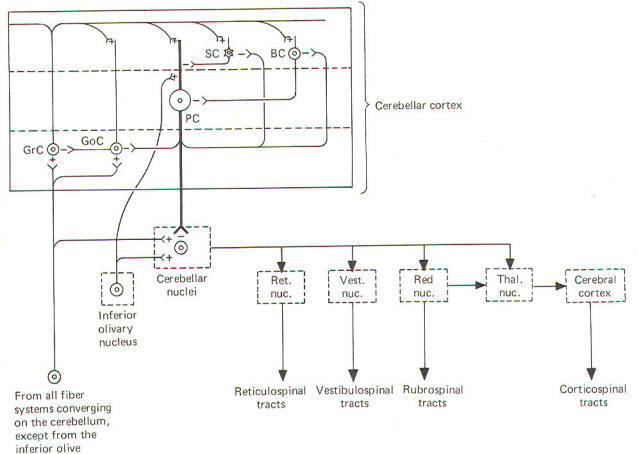 The efferent pathways include cerebellorubral, dentatothalamic, and fastigioreticular fibers. All of them emerge from cerebellar nuclei; the cerebellorubral fibers from the globose and emboliform nuclei, the dentatothalamic fibers from the dentate nucleus, and the fastigioreticular fibers from the fastigial nucleus. They emerge together from the various nuclei to ascend in the roof of the fourth ventricle and proceed anteriorly to the midbrain tegmental area medial to the lateral lemniscus. The cerebellorubral fibers cross over at this point to enter the contralateral red nucleus. The dentatothalamic fibers also cross over and ascend to synapse in the ventral intermediate (VI) and ventral anterior (VA) nuclei of the thalamus. The fastigioreticular fibers enter the reticular formation of the midbrain, pons, and medulla oblongata. Afferent pathways include the anterior spinocerebellar and tectocerebellar tracts. The fibers of the anterior spinocerebellar tract originate in Clarke's column of the spinal cord and cross in the anterior white commissure to the lateral funiculus, where they ascend to upper pontine levels before crossing back to enter the cerebellum through the superior peduncle. They terminate in the hind limb region of the cerebellar cortex. The tectocerebellar tracts emerge from the superior and inferior colliculi on both sides, terminating in the intermediate vermis (culmen, declive, folium, tuber, pyramid) and the lobulus simplex. The function of the tectocerebellar tract is not known, but it is widely believed to mediate visual and auditory reflexes. In recent years a good deal of experimental work has helped to illuminate the roles of individual cell types in the cerebellar cortex. Such work has led to the development of a generally accepted model of the interrelationships between these cells, as well as to some elementary hypotheses of how the cerebellum performs its role in motor control. Unlike the cerebral cortex, the cellular makeup of the cerebellar cortex is quite uniform throughout. A "plug" of cortex from one area is very much like that from any other area. Five types of excitable cells are found in the cortex, forming three distinct layers. Four of the five cell types are inhibitory, including Golgi cells, stellate cells, basket cells, and Purkinje cells. The fifth type, granular cells, represent the only excitatory cells in the cerebellar cortex. Each of these cells, their interactions with one another, and their relative positions in the three cortical layers are schematically illustrated in Fig-6. The deepest (granular) layer is made up of granular and Golgi cells. While the cell bodies and dendritic processes of the granular cells are located in this layer, they project long axons up into and through the Purkinje cell layer to ultimately reach the most superficial (molecular) layer. Here the axons run horizontally through the molecular layer as parallel fibers. Collaterals from these parallel fibers synapse upon and excite the dendrites of the other four cortical cell types. Golgi cells represent the other cell type found in the granular layer. Axons from these cells project to and inhibit the granular cells. Golgi cells typically project a large dendritic apparatus up through the two higher cortical layers. The molecular layer contains both stellate and basket cells. These relatively small cells are inhibitory to the large Purkinje cells of the middle layer. Typically, the stellate cell axonal endings are inhibitory to the Purkinje cell dendrites, while basket cells inhibit Purkinje cell bodies. The Purkinje cell layer (middle layer) is characterized by the presence of the Purkinje cell bodies. These large inhibitory cells represent the only output from the cerebellar cortex. They project flat broad dendritic trees (Fig-9) up into the molecular layer. Most of the Purkinje cell axons descend through the granular layer to leave the cortex and synapse in the cerebellar nuclei. Nevertheless, some of them from the flocculus and nodule, as well as the anterior and posterior vermis, project directly to the vestibular nuclei of the brainstem. Collaterals from these axons project to and synaptically inhibit the Golgi, stellate, and basket cells. Two kinds of fibers are afferent to the cerebellar cortex. 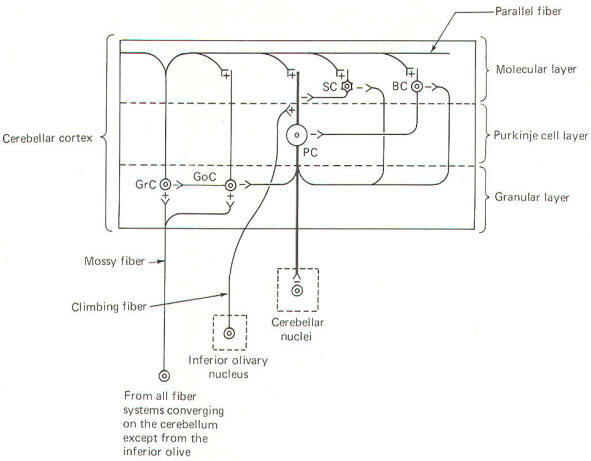 These are the so-called climbing fibers from the inferior olivary nucleus, and the mossy fibers from all other sources afferent to the cortex. Each climbing fiber enters the cortex and makes numerous synaptic contacts with the dendritic tree of a single Purkinje cell. By contrast, each mossy fiber synapses with several granular and Golgi cells. Both climbing and mossy fibers are excitatory to the cells they synapse with. Leaving aside for the moment a hypothesis of how the cortical cells integrate motor activity, let's have another look at the cerebellum as a comparator. Recall that the cerebellum is in a position to compare the actual performance of a motor action with the intended command signal and then subsequently initiate whatever corrective action is necessary through its efferent output. We now know that this output is a two-link process: first from the cortex to the cerebellar nuclei via the axons of Purkinje cells, and then from the cerebellar nuclei through the peduncles to the various brainstem nuclei (Fig-7). Through such output from the brainstem nuclei, the cerebellum can influence motor activity both at the cortical source as well as at the spinal cord level. Fibers leave the cerebellum via the superior cerebellar peduncle, projecting first to the ventral anterior (VA) and ventral intermediate (VI) nuclei of the thalamus, to ultimately modify cerebrocortical motor neurons through thalamo­cortical projections. Similarly, through cerebellar projections to the reticular, vestibular, and red nuclei, the cerebellum can modify spinal cord alpha and gamma motor neurons through the reticulospinal, vestibulospinal, and rubrospinal tracts. A small basal firing rate is generally observed in the efferent fibers from the cerebellar nuclei. This is apparently due to the excitatory collateral input of the mossy and climbing fibers. One can see from Fig-7 that the cerebellar cortex is in an ideal position to modify the firing of cerebellar nuclear fibers by varying the firing of the inhibitory axons of Purkinje cells which also synapse on these neurons. Recall that the firing rate of a neuron is a function of its central excitatory state, which is itself a function of the "integration" of the cell's excitatory and inhibitory input. We must recognize that even with the most recent information concerning the functional histology of the cerebellar cortex, little is still known about the way in which the cortex utilizes mossy and climbing fiber input. Because of the absence of long association fibers such as are found in the cerebral cortex, it is assumed that small discrete regions of the cerebellar cortex handle the full integration of their "own" climbing and mossy fibers, and can thereby direct appropriate output over their own Purkinje cell axons. The cerebellar cortex has been "mapped," and a homunculus for sensory cutaneous stimulation is illustrated in Fig-8. The homunculus represents points on the cerebellar cortex where cutaneous electrical stimulation produces evoked responses. While it is probably naive to suspect that proprioceptors from a given muscle project to the same region of cortex which modifies (through brainstem nuclei and descending tracts) the motor neurons to that same muscle, the possibility is intriguing and undoubtedly partly true. Evidence suggests that the cerebellar cortex "sharpens" the input from its afferent fibers so that it is constantly dealing with the strongest (and presum­ably most important) input at all times. A possible mechanism for this sharpen­ing is presented here. As Fig-9 illustrates, the dendritic trees of the Purkinje cells are relatively flat and run in a plane transverse to the folds of the cortical surface. The parallel fibers of the granular cells pass through these trees much like telephone wires on a series of poles. Because the parallel fibers run parallel to the long axis of the folia (folds), they cross the dendritic trees at right angles. Consequently, when a discrete cluster of granular cells are stimulated, a narrow strip of excited Purkinje cells is produced down a limited length of the folium. These same parallel fibers also make excitatory contacts with basket. stellate, and Golgi cells. Now recall that each of the latter are inhibitory neurons. The stellate and basket cells are relatively small and hence have low excitation thresholds, rendering them easily stimulated by the parallel fibers. Their axons are directed at more or less right angles to the parallel fibers and make synaptic contacts with the dendritic trees of Purkinje cells on either side of the narrow excited strip. Because basket and stellate cells are inhibitory, the result is the production of a narrow inhibited zone (inhibitory surround) of Purkinje cells on either side of the narrow excited strip. It has been postulated that these ever-changing patterns of excited strips flanked by the inhibitory surround provide neural sharpening which enables the cortex to deal only with the strongest input at all times. If the mossy fiber input to the cerebellar cortex is sufficient to excite a great number of granular cells in a particular locus, it follows that the width of the excited strip would increase. Theoretically, this could cause the degree of neural sharpening to decrease. Current thinking holds that this is prevented by inhibitory action of the Golgi cells. These cells have very extensive dendritic projections which are not limited to a single transverse plane like the Purkinje cells, but rather extend through the molecular layer to share space with the dendritic trees of as many as 10 Purkinje cells. Now the Golgi cells aren't as easily excited as Purkinje cells because a proportionately smaller number of their dendritic branches receive excitatory input from the parallel fibers. However, if the number of granular cells firing increases, the strip of excited Purkinje cells becomes wider also. Nevertheless, at some point the Golgi cells will become sufficiently stimulated by the increased number of activated parallel fibers to inhibit the granular cells, preventing the widening of the excitatory strip to a point where its sharp focus is lost.